It is said that a good Italian dish can be whipped with just 5 simple ingredients. But what is often missed out from that statement is this, that mastering the basics in the kitchen, let alone an Italian one, takes a lot of patience, some luck and years of hardwork. This is one of the reasons why Italian cuisine somehow intimidates me to this day. Well aside from the fact that dining in a decent Italian restaurant in the Philippines often comes with a hefty price tag. “But Italian should not intimidate you,” Joel Binamira, a well-traveled food blogger and an accidental restaurateur, told me over lunch not too long ago. We were then waiting for the various dishes to be served at Pigafetta, his recently opened restaurant along Escario street in Cebu. It’s named after Antonio Pigafetta, Magellan’s chronicler during his historic voyage, albeit an ill-fated one, around the world. Pigafetta has a predominantly black and white interiors exuding a modern yet casual vibe. There is a retail table by its entrance where dining guests can avail of Joel’s curated display of various ingredients and kitchen implements. By some stroke of wonderful coincidence, it was actually from this Venetian scholar’s accounts where Joel got the idea for a name for his first venture into the food business – the Zubuchon Restaurant. The cast-iron pans are for sale but the exquisite machuca tiles are not for grabs. Putting up an Italian restaurant in the city may seem to be a complete departure from Joel’s successful porcine adventures. Binamira explained that Italian cuisine is actually one of his personal favorites. That is why when an opportunity to set-up one came, he immediately grabbed that chance. To make the long story short, banking on his experience with the Zubuchon and then pulling in the right partners and crew for a 50-seater restaurant, he launched Pigafetta last October. An excellent selection of mixed anti-pasti was served first. Salami, parma ham, sundried tomatoes, olives, arugula and prosciutto – all of these were gloriously resting on a molave plank. The Polpettini or meatballs drenched in tomato sauce were very flavorful and gratifying. While I tried to paced myself for the onslaught of dishes that afternoon, I couldn’t resist in sneaking in one more bite or two of these goodies. I wished I could say the same for the All’ Amatriciana. Don’t get me wrong as the bucatini noodles were cooked al dente, but I was probably craving for a carbonara that time. We also tried the Formaggi Pizza, which is from the Pigafetta medium-thin crust selection. The restaurant also serves the more classical Neapolitan types with medium-thick crust and made with Caputo flour. 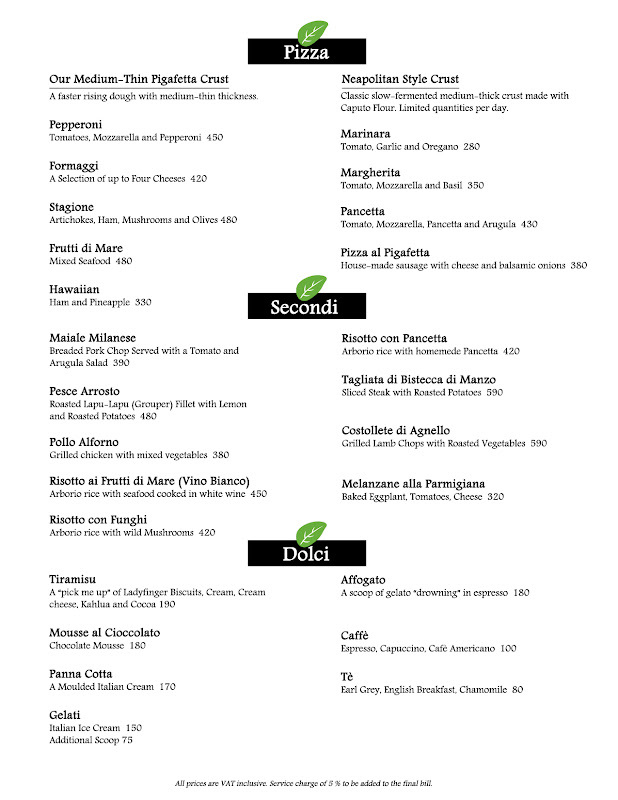 Binamira knows that theirs is not the only Italian restaurant in Cebu. But he does not want to compete with the already established places in the city. He’d like to show that at Pigafetta, a properly cooked Italian dish can still be very affordable. He added that he was able to keep prices at a mid-range level by not importing too much expensive ingredients. For instance, he sources his mozarella from a local cheesemaker in Bacolod. Most of their cold cuts is taken cared of by a supplier based in Makati while their pancetta, which figures prominently in the menu, is homemade. The mains or the secondi piatti were undoubtedly the most memorable for me. We had the Costollete di Agnello – well-seasoned lamb chop, grilled medium-rare. It came with roasted vegetables on the side. But if there’s one that you should not miss at Pigafetta, it has to be the Risotto con Funghi. The creamy and al dente arborio rice is punctuated with welcome hints of brine and laden with unmistakable umami from the wild mushrooms. For a toe-curling dish such as this, it’s understandable if you wouldn’t want to share this with your dining companions. We ended our meal with slices of Tiramisu and a Panna Cotta, a dessert that I usually avoid. I thought that the latter would be a textural/starchy nightmare but thankfully it was wonderfully jiggly and not as wickedly sweet as I imagined. I was about to order a shot of strong espresso to round off our lunch but my dining companion convinced me to go with a cappuccino instead. She was worried that I might not be able to function properly at work, well after all that delicious food and all those glasses of wine. The cappuccino was good by the way and may be even cheaper than the same signature drink from the coffeeshop next door. Chef Jason Feeney, who developed most of Pigafetta’s menu, then joined us for a quick chit-chat. He shared to us that he worked as an executive chef at a luxury buffet in Manila before heading the team in Cebu. I assumed that he has Italian roots because he was able to pull off such authentic flavors. Jason surprised me when said that he is Irish-Filipino. He was only able to learn to heart the cuisine (and became fluent with the language too) when he stayed in Italy for 2 years. I rarely, if at all, describe a restaurant as authentic this and authentic that. But I now think that authenticity, especially in this industry, still matters in the sense that it only provides context but necessarily validation. The delicious irony is that these days, you can still have a terrible ravioli in Venice and at the same time enjoy a spectacular osso buco in New York. In the case of Pigafetta, we have an Irish-Filipino chef teaming up with a Cebuano crew. The combination worked as they were able to serve all these ‘simple’ Italian dishes that are authentic in flavor, non-intimidating and truly memorable. Opens daily, 11 AM – 10 PM. | Major credit cards accepted. 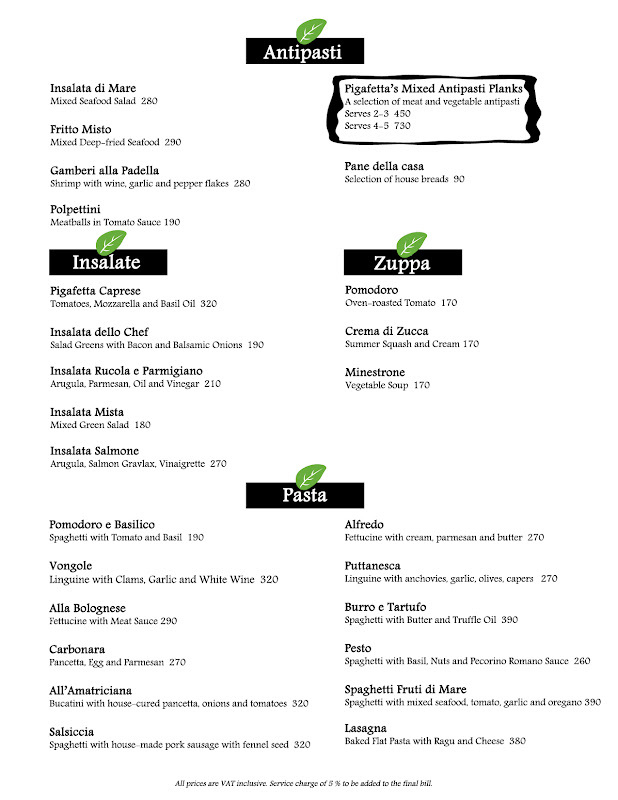 Download the Pigafetta menu here and here. Disclosure: The blogger would like to thank Pigafetta Restaurant for the gracious invite. Even so, he maintains full editorial control of this restaurant feature.